"Off-set to the right" is the arrangement I suggest for all long blades (75 cm and up), especially if they are somewhat heavy (500g or more)." 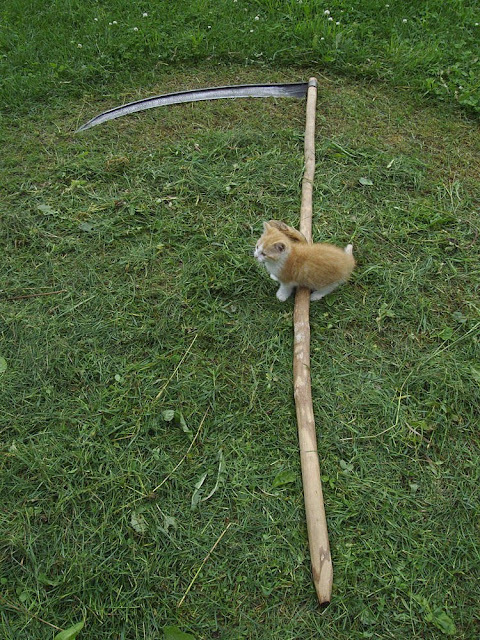 A long-bladed scythe, provided it is otherwise well adjusted, can indeed function very well and be a pleasure to use EVEN if the blade is not “off-set to the right”. However, that “already good” scythe will be still nicer to use if the blade’s horizontal balance is shifted to the right by a rather uncommon principle of snath design. I have made “wildwood” specimens incorporating this feature for about 8-9 years, and have advocated the concept widely in all of the 10 countries I’ve traveled with various demo scythes in hand. 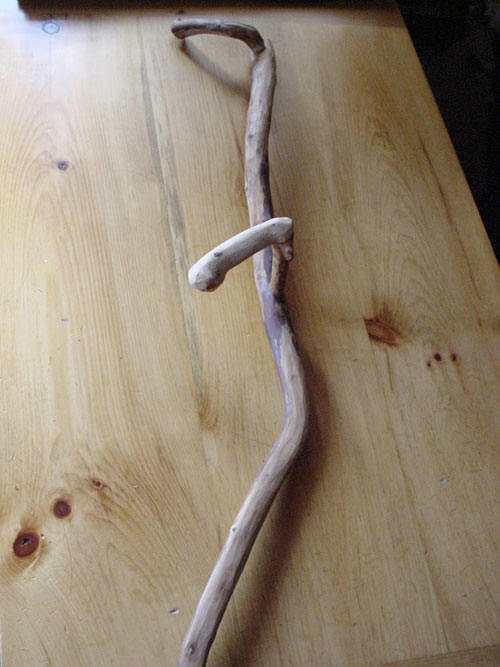 Although everyone who tried them was impressed with their feel and functionality, only a small fraction of snaths made subsequently (of wild wood or sawn lumber, either owner- made or in a production line) have incorporated this unorthodox principle. Breaking through walls of tradition has never been easy; and while this sometimes is a good thing, I wish it were different with regard to snath design. 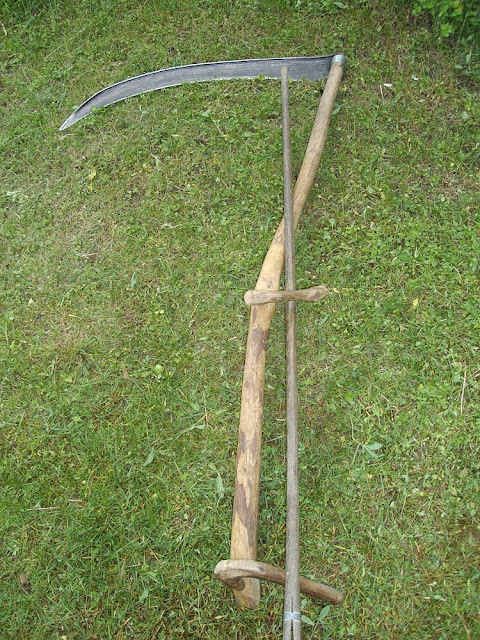 Be that as it may, below are some examples of scythes with this favourable shift of the blade-to-the-right (of the straight line drawn between the position of the hands holding the snath). 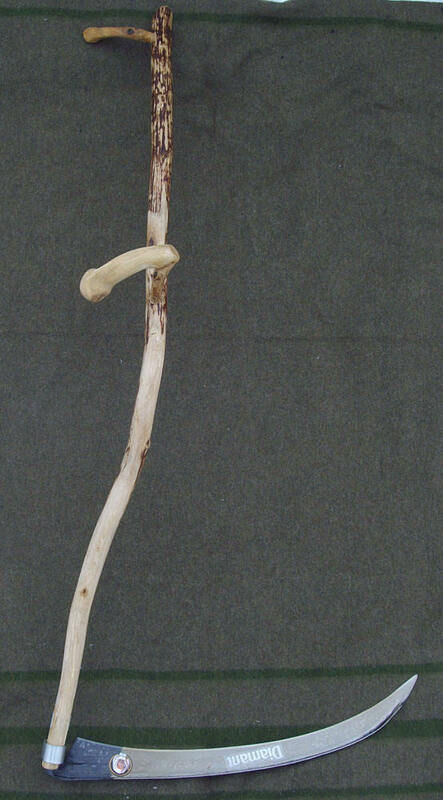 Unfortunately the bottom end of this snath (made of naturally curved apple branch) is not shown here and consequently the picture is somewhat misleading. Past the point you can still see, the wood makes again a left hand turn and then continues in line with the shaft just below the grip. 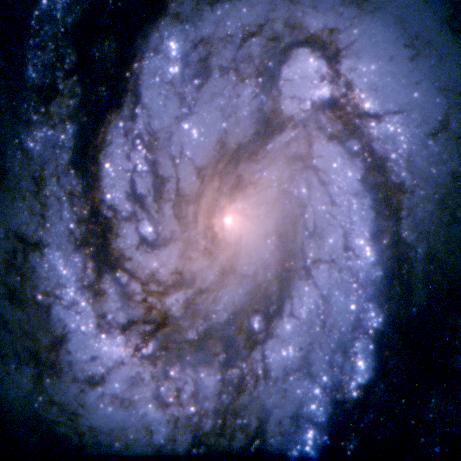 The end effect was an “off-set” of nearly 12” (30cm) to the right. I used this snath during the team competition in Denmark (shown above). Same snath as previous photo. The wooden stick shows the amount of “off-set”. Here the lower half of the snath makes a right turn only (i.e. doesn’t turn left again as in the snaths above) to accommodate the typically open-hafted blade models. This blade has a very acutely-hafted tang, (similar to #103 in our catalogue). Three snaths with off-sets similar to previous photo (and with Italian-made steeply hafted blades). 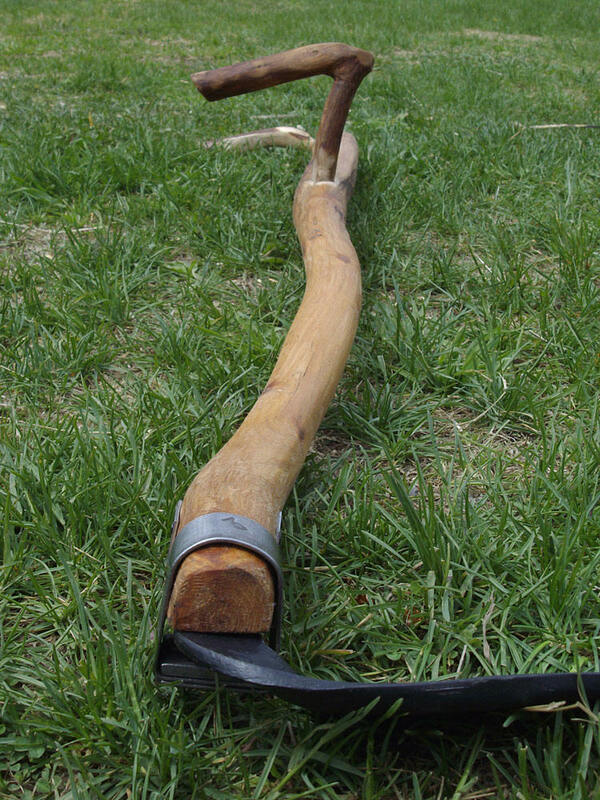 This snath is made of sawn 1½” lumber deliberately steam-bent to follow the design principles outlined here, and at the same time accommodate blade models meant to go on straight (left-to-right) snaths. Lance Harvell (who may well be the best mower in the state of Maine) had the blank bent by a snowshoe maker and brought it here for us to finish. He already had several wildwood snath/blade units from us, made along these lines, as well as others made later by himself. He can appreciate the principle behind these snaths – especially so because he is an avid long blade user. The blade he last picked from our limited old and long blade selection was 110cm and not exactly a light one… He wanted it fitted to the blank he brought along, and with backward-pointing grips, as he is accustomed to using. We did what he asked for, although I knew that a blade of that length and weight would feel more balanced with the grips pointing up and forward. So I improvised a little… and added such grips as well. Now he has a four-grip snath (interchangeable two pairs each, adjustable in two positions) – and the unit sure feels more ergonomic when held by the up and forward pointing grips. This very narrow blade (85cm length) also has a rather acute tang setting. Note how the one-grip snath also makes a slight right turn. This is the unit in action here. 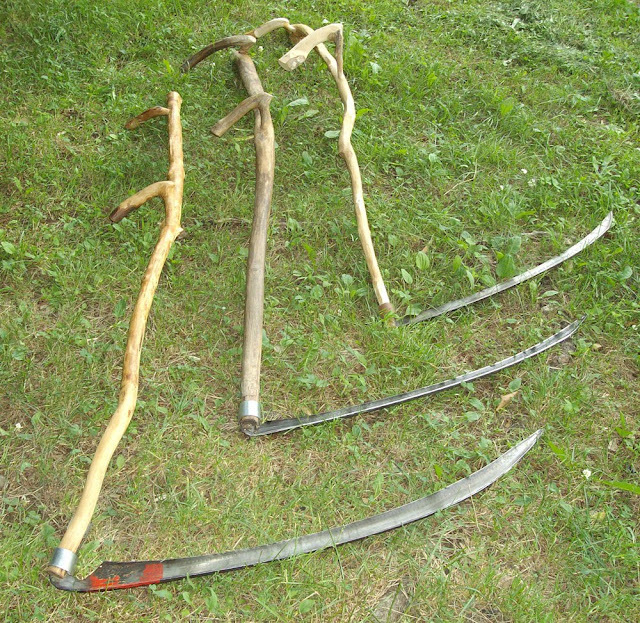 More samples of the off-set; (from right to left: with 75, 85 and 100cm blades). 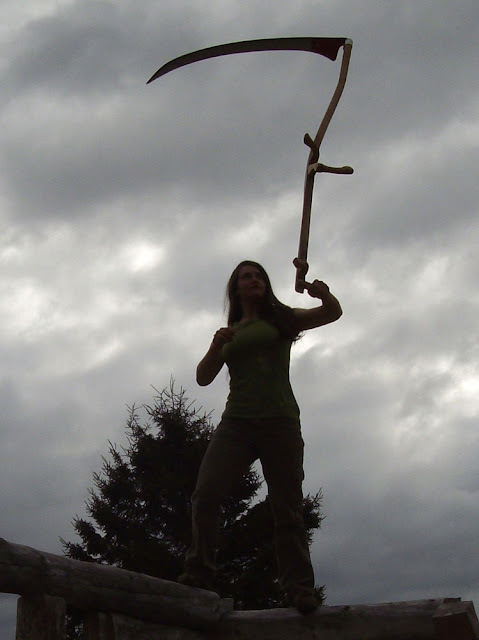 The snath with the 100cm blade and a stick indicating the actual off-set. Sideways view of the above – in order to address two additional concepts:Firstly, this snath is crooked in so many directions that it can be appropriately be referred to as “curved”. However, its bottom end curves downward – the opposite of the common curved snath models. My point in bringing this up is that a snath does not need to have the classical S shape curvature to work well. What is important is the relationship between the blade’s tang angles and the curvature of the wood, as well as the mower’s height and stance. Second thing of note is the length of the extension (stem) on the lower grip – it is rather short; much shorter than the new generation of “ergonomic” snaths have them. I have tried to bring attention to this concept for several years now (see, for instance retrofit), but it is a somewhat uncomfortable topic among those who make and/or sell snaths. Namely, the tendency to come up with a “good for every purpose” snath (and claim it to be “the ultimate” in design) is very strong. Be it as it may, the truth is that cutting and pushing more matter at a stroke (the natural by-product of using long blades) is notably easier if the right hand grip has a short, rather than long stem (extension). 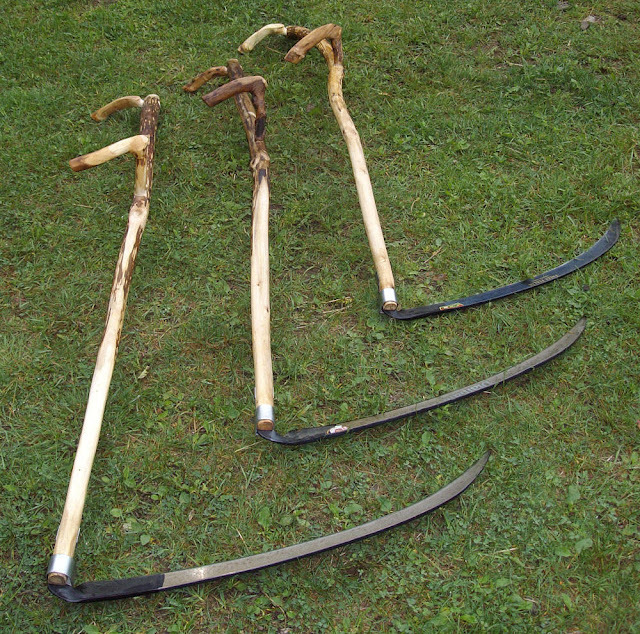 At least some of the Swiss had that figured out long ago, because many of the mountain snath models still produced today have very short-stemmed grips. 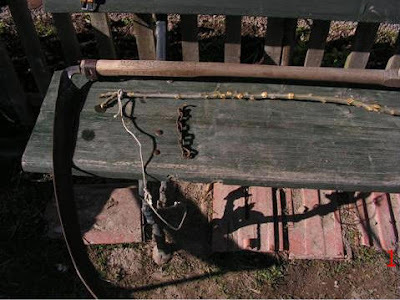 These photos show the classic type of grain cradle used in Central Slovakia. 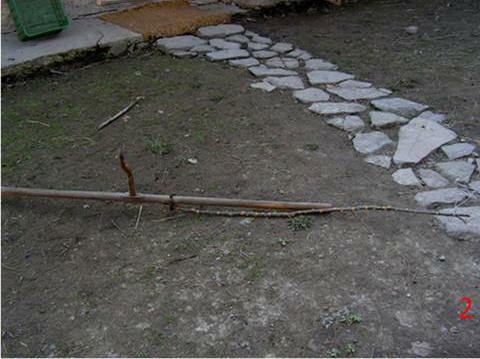 This simple design requires only a short length of chain, a suitable tree branch (or sapling), some cord, and a screw at the end of the one-grip snath. 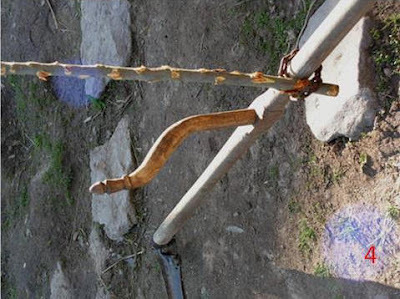 The loop of chain is used to loosely attach the branch to the snath, as shown in this photo. Moving the branch into position will then tighten the chain and hold the branch firmly against the snath. 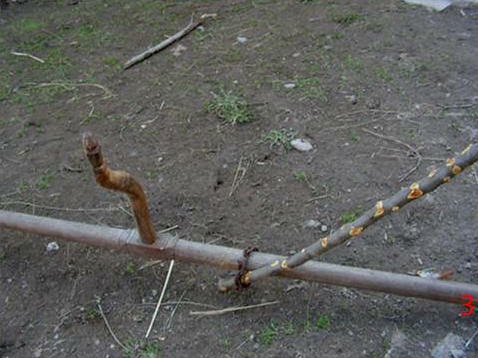 When the branch is perpendicular, the chain is tight and the branch starts to bend. 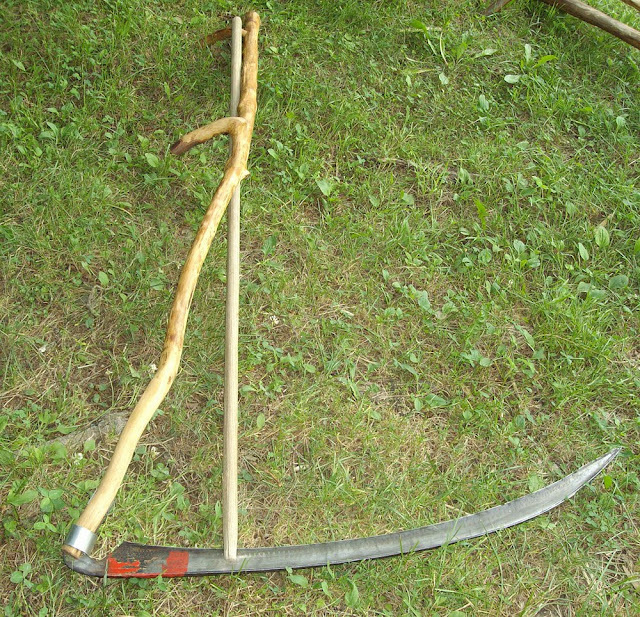 The snath grip acts as a brace to hold the branch in place while the scythe is being used. The cord is tied to the branch and looped around a screw at the end of the snath. 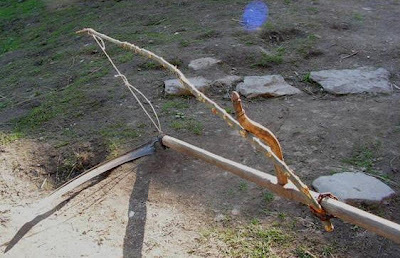 After making easy adjustments to the length of the cord and the position of the chain, the grain cradle is ready for use. "This rather quickly written piece on a very pertinent subject is meant as a provisional response to the growing interest in the grain harvesting scythe, often referred to as a “cradle scythe”. To begin with, I’d like to present some “facts” (call them opinions if you wish), which I intend to substantiate here at a later date. 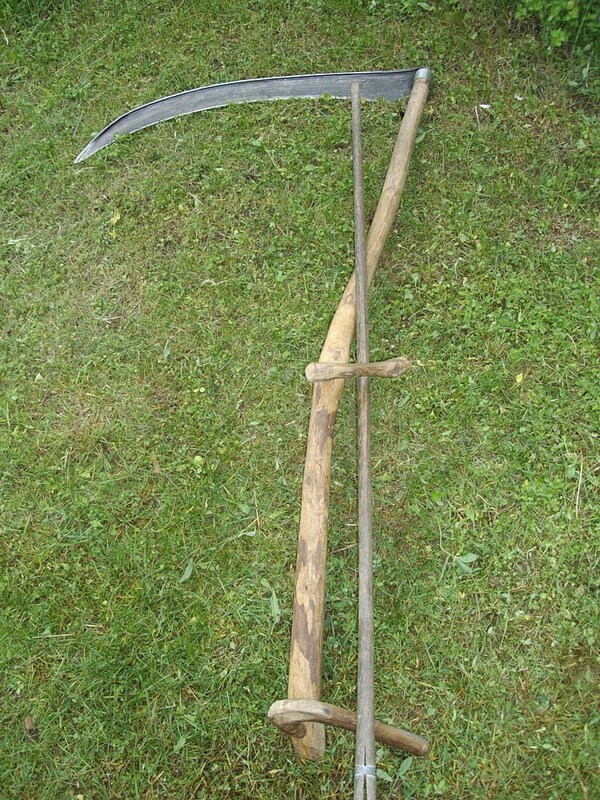 For harvesting relatively small (family bread supply- size, for instance) plots of grain, the sickle (rather than the scythe) may well be the tool of choice. 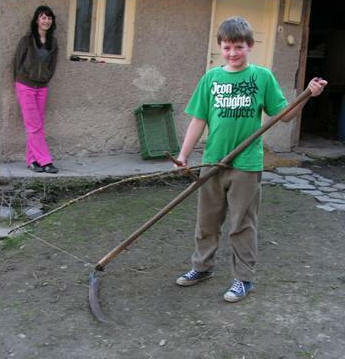 For larger acreages of grain than you may feel like tackling with a sickle, the grain-harvesting outfit traditionally used in Central Slovakia is a relatively simple and efficient alternative. 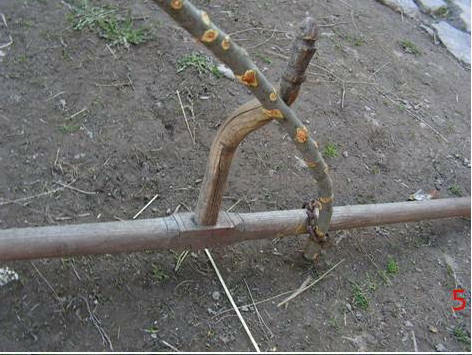 The body of the cradle consists of a green (and thereby flexible) hardwood branch or thin sapling and a piece of string. (The wooden piece used in these pictures is a branch of a wild plum – hence all the knots.) The string is tied to the end of the branch as well as a small nail/screw/staple at the lower end of the snath. By lengthening or shortening the string, the branch is pulled into a position most suitable, depending on the height of the grain, to hold the cut stalks. The weight of this cradle is a fraction of the more complicated contraptions – and, most importantly – is easily owner-made! 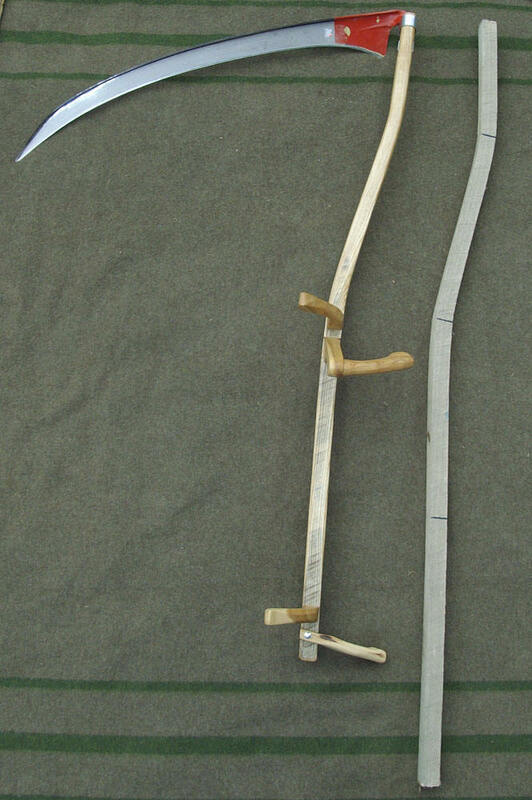 None of the snaths mounted with a cradle that I have seen in museums in several countries (as well as pictured in books) had the lower grip facing backwards (meaning toward the person operating them). 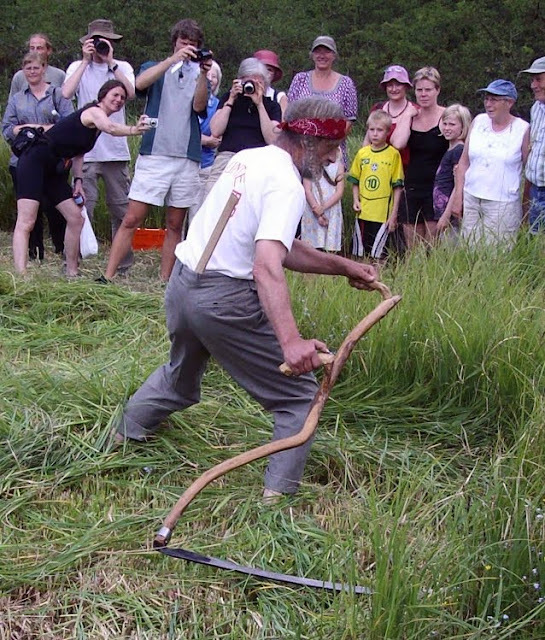 This was the case even in regions where the general purpose (“grass”) scythes had their grips pointing backwards – the way the now popular version of Austrian/European snaths have them. In any case, I think that the folks in the UK (using the Swiss made snath version sold by the Scythe Shop along with the cradle made by Steve Tomlin), as well as all those buying their “grain scythes” from Scythe Supply and Botan Anderson (mystic prairie) will end up working a lot harder for their bread than is necessary…"
Q: I've been mowing my lawn this year with a scythe, and so far I'm very pleased. I've run into one problem so far. 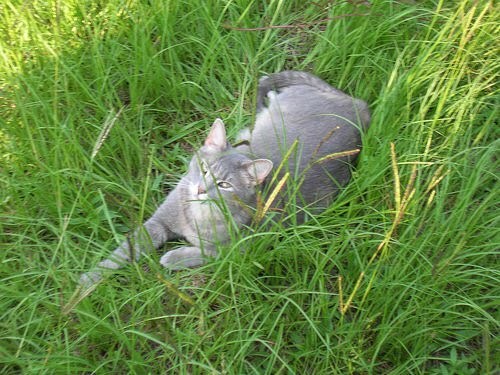 My lawn, like many in this area, is bahia grass. This grass likes to be mown high -- four or five inches or even higher. It resents a close cut. Sometimes while I'm mowing, the blade will ride along the top of the grass, clipping just the tips of the blades and especially the tall V-shaped seed heads this grass sends up, and the lawn looks good afterward. But sometimes the blade wants to "dig in" and cut the grass close to the ground, and it takes the lawn a while to recover. I've found that it helps to keep a loose grip and not press the blade downward. I keep experimenting with hafting angles. I was wondering if you have any additional tips for achieving a high but even cut. (1) Adjust your snath (if possible) so that the blade will "hover" four inches above the ground when you are holding the snath with your right arm fully extended (assuming that you are right handed). Otherwise, trying to consistently cut four or five inches above the ground will probably tire your arm muscles and give erratic results. (2) Check the horizontal balance of the blade during the swing. If the tip of the blade naturally tends to dip downward during the stroke (which would cut some grass too short), then make adjustments to the snath (if possible) according to the instructions here concerning horizontal balance. If snath adjustments are not possible, then move the arms and wrists slightly during the swing to keep the blade level. (3) It may be useful to adjust the "lay" of the blade to increase the upward tilt of the sharp edge, especially if snath adjustments are not possible and you are relying on your arm and wrist muscles to modify your swing. This is done by inserting a wedge between the snath and the tang of the blade, as shown in the instructions here concerning the lay. (4) Continue experimenting with the hafting angle to see what works best for you. (5) Keep the blade sharp, as a dull blade either bends the grass over or requires more swinging force, which can make the cuts more difficult to control. (6) For best results, try to mow in the mornings (or on cloudy days, even in the rain if it's not during a thunderstorm) before the sun dries out the grass. Good luck, and feel free to give us an update. When they said, "Well! I never!" 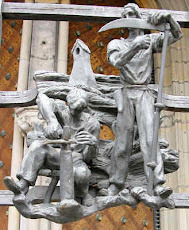 he cried, "Scythes for ever!" That lively old person of Blythe. 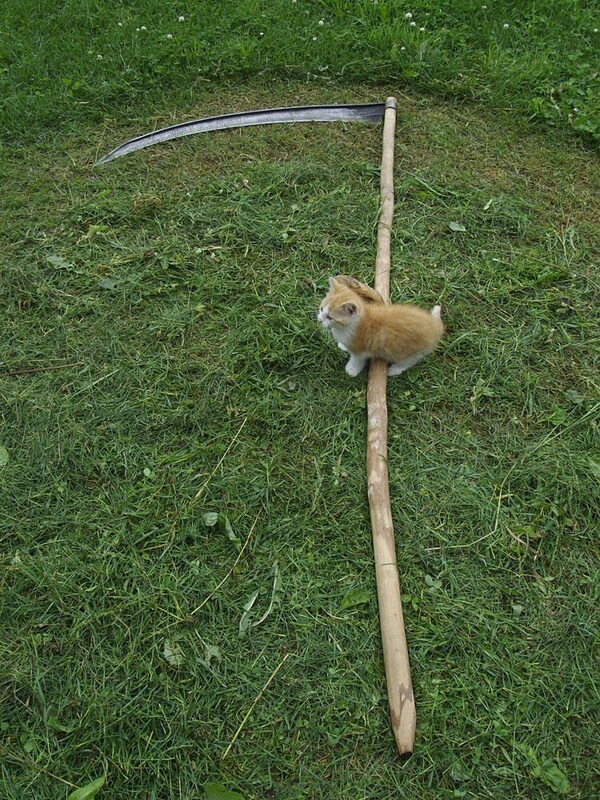 Is there an off-the-shelf scythe which can be adjusted to fit anyone, regardless of height? Is this even possible? The answer is "Yes". Here is a method of blade attachment which, when combined with an adjustable one-grip snath, can be adjusted to fit any height person for virtually any blade (regardless of tang steepness). To make the snath adjustable to fit anyone, a number of dadoes (six or more) can be made on the snath for additional grip locations, and the total length can be more than six feet (with a longer rounded section for the left hand position). 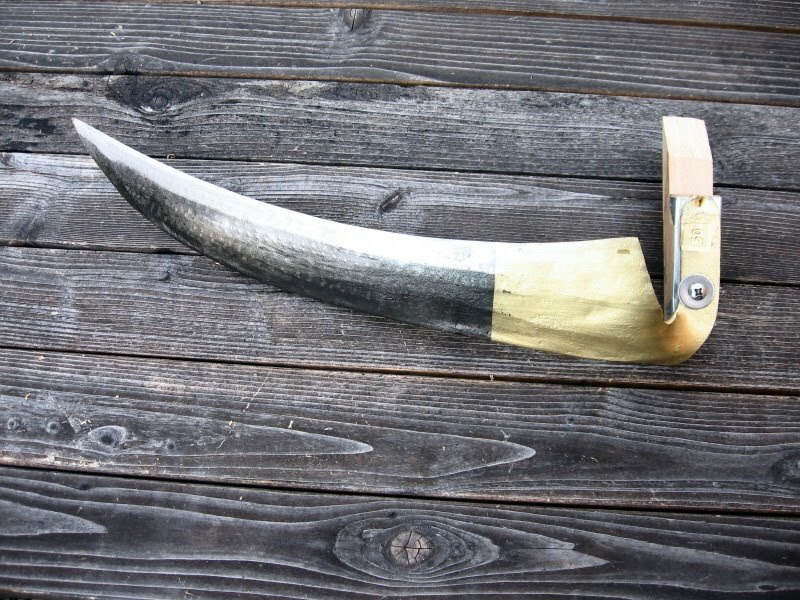 Now that the snath can fit any person, it must now be fitted to the blade. 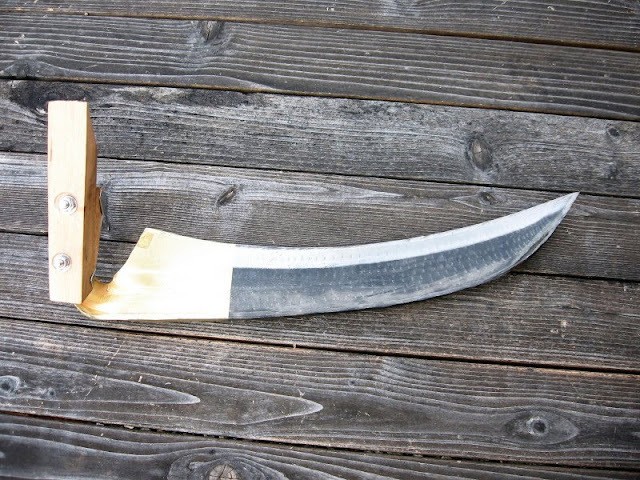 With this "Universal Scythe" design, the blade is bolted to the snath, requiring a hole in the tang of the blade. 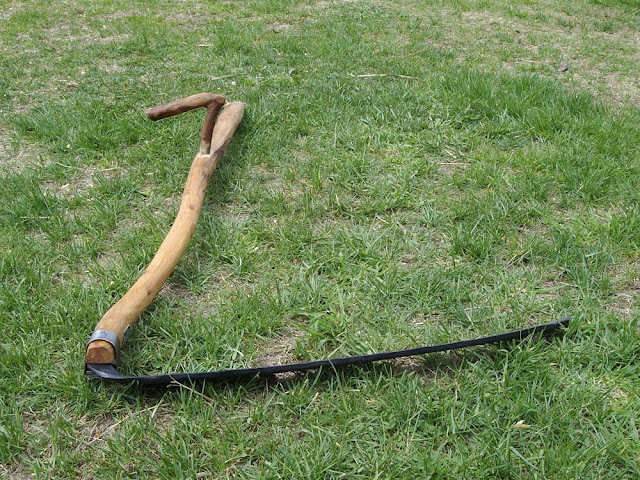 Some blades already have a hole in the tang, such as blade #00 from the ScytheConnection catalogue, pictured here. A hole can otherwise be drilled into the tang of a blade to make it work with this attachment method (I've previously had a local machine shop drill a hole in a scythe blade for a few dollars). The "Universal Scythe" design can accommodate a wide range of wedge sizes for adapting the snath to a specific user/blade combination. In this example, let's use a blade with a tang steepness of 25 degrees (such as blade #00), and let's assume that a tang steepness of 45 degrees is required for a given user of the one-grip snath. A 20 degree wedge (45-25=20) would then be used to adapt the blade to the snath and user. The blade and wedge are bolted securely to the snath using a special "Piesslinger patent" metal plate which has been modified for this purpose. (The Piesslinger patent attachment was mentioned in a previous post here.) This photograph show the modified Piesslinger plate, with the wedge and two bolts used for this example of the "Universal Scythe". This method can accommodate a blade with a single hole and a wedge of any angle. With the two bolts tightened, this blade attachment is extremely strong. No ring clamps are needed. In these photos, the snath has been reduced to seven inches in length for simplification. The snath section is left square at the blade end, since there is no need for partially rounding it. Because of the added angle of the wedge, the end of the Piesslinger mount needs to be bent to conform to the snath end. It is not necessary to nail the Piesslinger mount to the snath, as it is held quite solidly without nails. 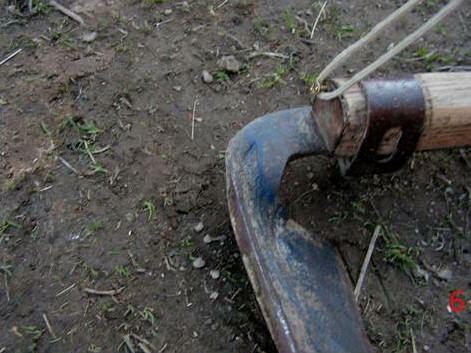 The wedge is connected to the snath by the two bolts. The lower bolt also holds the blade against the snath. 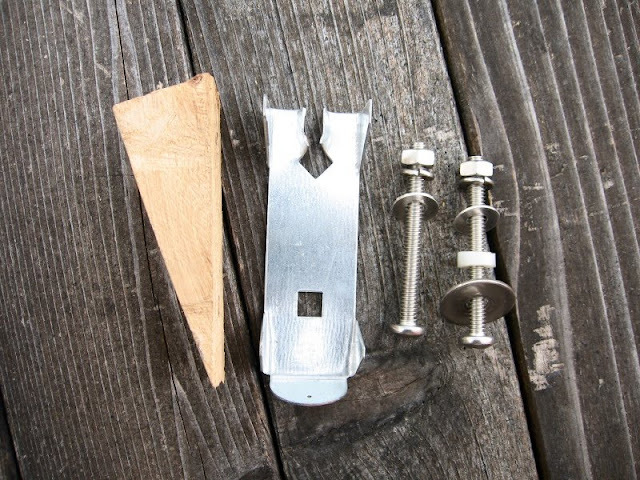 Since the bolt is a quarter-inch diameter, and the tang hole is a half-inch, a piece of white nylon bushing is used to hold the blade solidly. Since the nuts protrude from the snath at an angle, the tops of the holes were countersunk to provide flat contact with the wood. A washer is used under the blade, and smaller washers and lock washers are used with the two nuts. 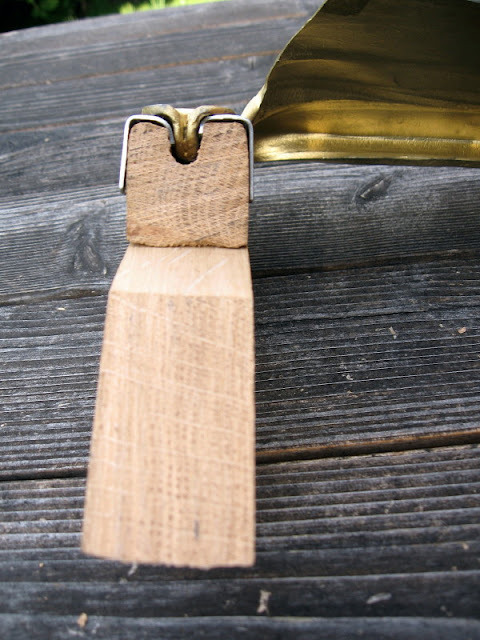 A groove was made in the back of the wedge to hold the knob of the tang. 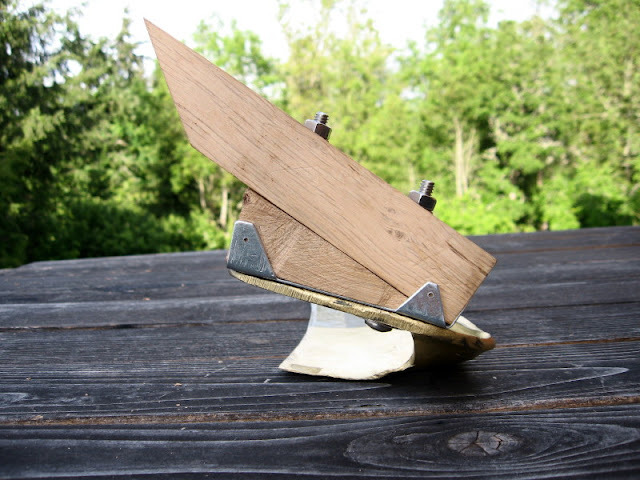 Hafting angle considerations for the specific blade will influence the location of this groove. I cut the corresponding end of the Piesslinger mount with a hacksaw and bent the metal flaps into the groove to hold the knob more securely. I figured that this would be stronger than simply cutting a keyhole into the metal (i.e., cutting away the flaps). The flaps were easily bent by putting the cut Piesslinger mount and wedge into a vise, and gently hammering the tang knob into place. When the blade is being mounted to the snath, the upper bolt is first attached (since this is located under the tang near the knob). Then the Piesslinger mount and tang are put into place and the lower bolt is attached. The nuts are tightened with a small wrench. A wide range of wedges with various angles can be made available for a precise fitting of the "Universal Scythe" to the user. This type of blade attachment can also be used for other snath designs, including the Oregon Snath (described here).